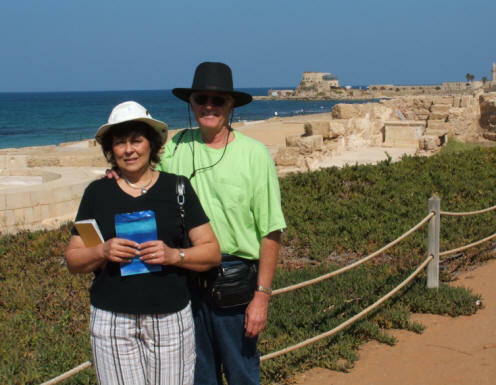 We've chosen to go to Israel at this special time of year, not only to tour the land and connect with Messianic Believers there, but also to observe the Biblical Festival of SUKKOT (the Feast of Tabernacles). There are 3 groups with major celebrations there: (1) The International Christian Embassy Jerusalem, (2) Barry & Batya Segal, and (3) the International Christian Zionist Center. Sometimes people have a tendency of thinking that Israel isn't a safe place to be - but that's just not so. When we were there in 2005 (and again in 2011), I felt just as safe as if I were in my own home. I've had several people to talk to me about planning a trip to Israel and backing out at the last minute because of fear. The truth is, Satan doesn't want you to go. He doesn't want you to gain a better understanding of the Bible by walking in the footsteps of Yeshua. He doesn't want you to see the warmth of the Jewish people. He doesn't want your life will be changed as a result of a trip like this. To travel as a group to Israel will take a lot of planning, commitment and discipline - as well as a lot of preparation. Much of the preparation for what will be to some a "once in a lifetime trip to the Promised Land" is done months in advance. It seems far away, but it is amazing how fast the time will pass. Even with all the months of preparation, some may feel that they are not ready when the day comes! The cost for the trip should cover your flight (both ways), hotel reservations, breakfast & dinner each day, touring cost, tips, entrance fees to exhibits & locations on tour. I spoke with Heather at JDI Travel (the travel agency that handles the Vision For Israel Sukkot Tour & Conference) and the cost for the 11-day 2009 trip was advertised as $3699 each - which included a $500 airline fuel surcharge. Prices eventually lowered slightly. Our 2011 trip will be a 12-day trip. The date was selected with plenty of time to give those interested in going an opportunity to save for the trip. You have 18 months to save for a trip that will cost approximately $3500 each. For a couple, that's $7000 - and that doesn't include the money you'll need for buying lunch while in Israel, or your souvenirs. $7000 divided by 18 months means that a couple needs to be saving $389 a month - an individual would need to save $194 a month over the next 18 months. The decision has been made that we will be traveling with Highway to Zion Ministry out of Charlotte, NC. The cost of the 2010 trip is about $3875, and the 2011 trip should be about the same. 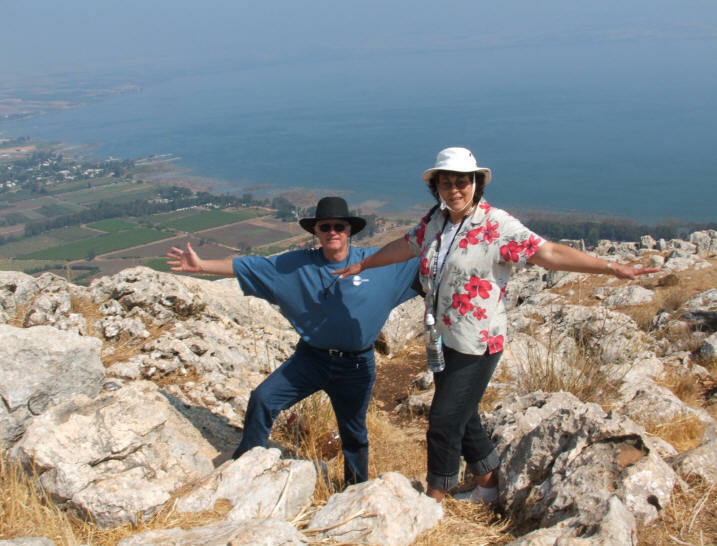 Cathy Hargett has made NUMEROUS trips to Israel and this will be a wonderful opportunity for us to further connect with Highway to Zion. Like everything else, the cost of the trip is now slightly higher. A trip for two at $3800 each will total $7600. If you need to save the money for the trip, that'll be $507 a month for the next 15 months. Trips to Israel can be taken for less than this price, but we've chosen to go during Sukkot - which is Peek Season for visitors. 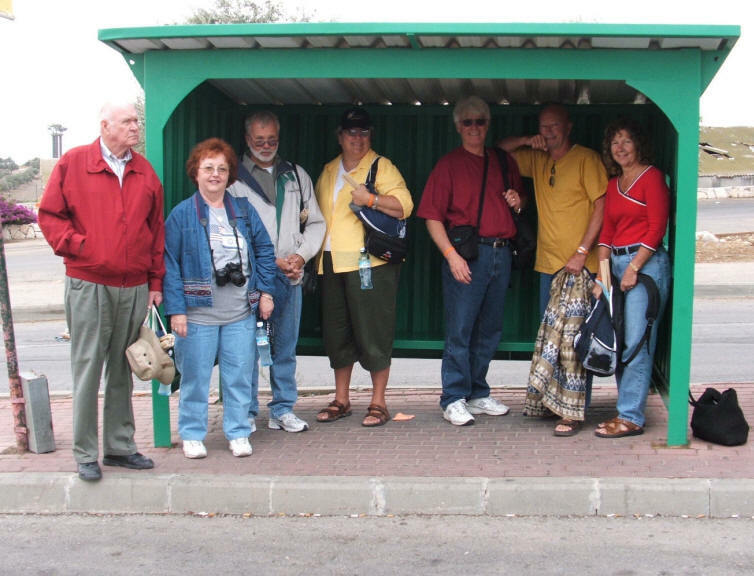 Most Israel trips are typically for 10-days. You will be limited to the number of suitcases you can bring with you, as well as what each one can weigh. Be prepared to have your luggage checked at some point. Israel's security is very tight. 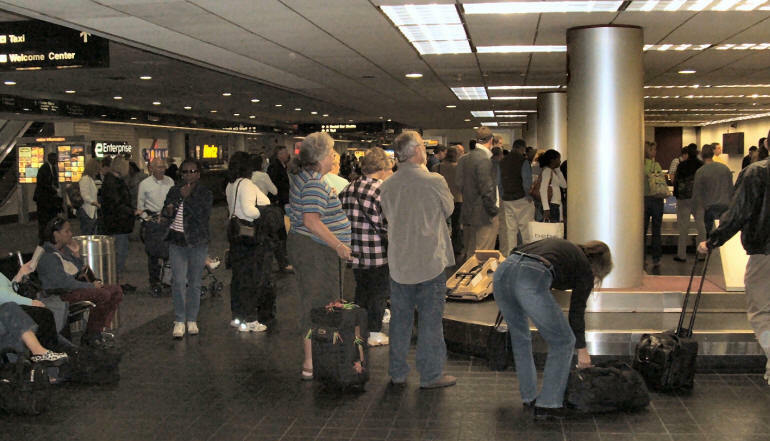 Now more than ever, airlines are imposing hefty penalties for heavy baggage. On most International flights, each passenger is allowed to check two items free of charge. Each item must not exceed a weight of 50 lbs. Those bags weighing in excess of that amount incur a fee of $50. Each additional item incurs a fee of $150 USD. We did take some bottled water with us in 2005 that we carried with us when we were touring - but be careful, water is heavy. Once the bottled water was used, there was room in the suitcase for souvenirs on the return trip home. Bottled water is usually sold on the tour bus by your bus driver, so you'll always have water available - even if you don't carry your own. You'll need to conserve space with your packing for the 10-day trip. Choose clothing items that can be worn more than once. For example, I could wear my jeans for several days but I changed my shirts daily. You'll also need a swimsuit or shorts to go into the Dead Sea. Don't buy new shoes for the trip. You'll be doing a LOT of walking so you'll need comfortable shoes. We also took some shoes that we could wear when we were in the water at the Jordan Baptismal Site as well as the Dead Sea. You might want to consider a hat, as well as sun-blocker. Israel has products like sun-screen and toothpaste but they are expensive there - so take what you know you'll need - but not extra. Temperatures in Israel are similar to those here in North Carolina. 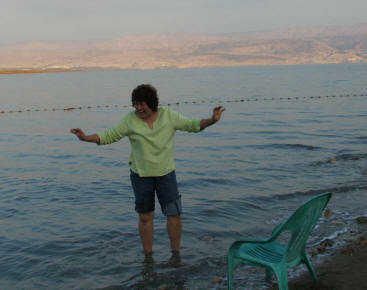 When we were in Tel-Aviv, at the Dead Sea and in Tiberias at the Sea of Galilee, I wore short-sleeved shirts. Jerusalem, however, is in the mountains and the temperature is cooler. I wore a thin coat the entire time we were in Jerusalem in 2005 (but not in 2011), so you'll need to pack something for cooler weather (and the evenings in Jerusalem). Note that Jerusalem's usual temperature for October is 60 to 78F. 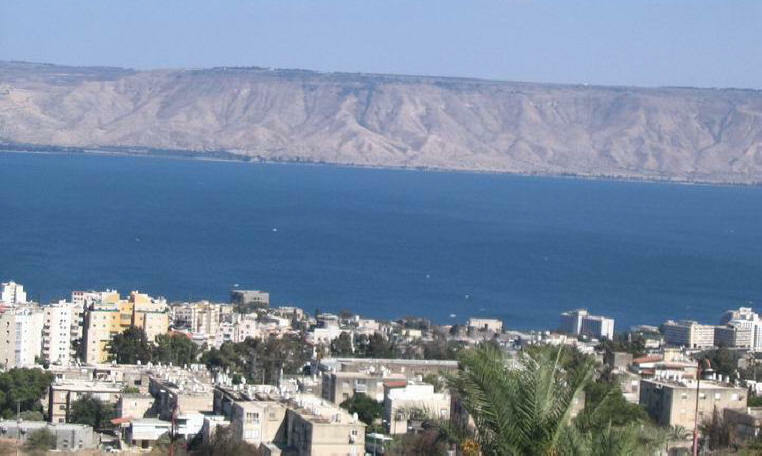 Tiberias (the Sea of Galilee area) for October is 65 to 89F. 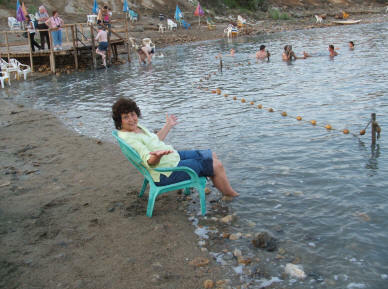 The Dead Sea area is 75 to 90F for the same time of the year. Jerusalem is higher in elevation - you always go "up" to Jerusalem - so it will be cooler there - especially by the end of October. This chart shows the temperatures for Tiberius at the end of July - they're about the same as those in North Carolina. 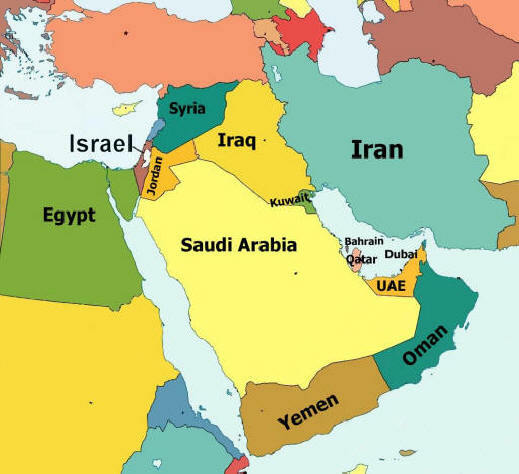 Like Europe, Israel's electrical current is not the same as what we use in the US - which means your hair dryers, battery chargers, etc. won't work without a European "adapter". The prongs on the plug are different. I borrowed one for my first trip to Israel, but they can easily be purchased from Wal-Mart before your trip. 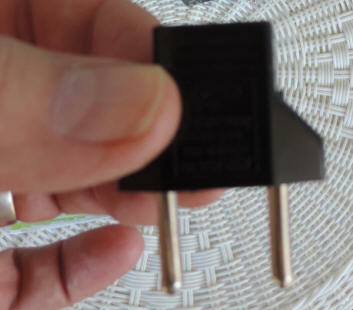 You'll need one to use with any electrical appliance you bring from the US. 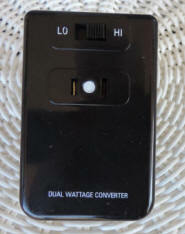 Check out this link Wal-Mart to see their converter & adapter package. 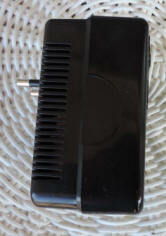 Converts 220 V electricity to 110 V. Includes high-low converter, with high-low switch and 4 adapter plugs. 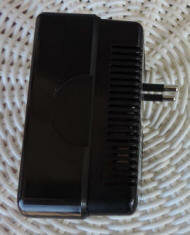 Includes adapter plugs for Europe, Great Britain, Australia, China, Africa, Middle East and others. Use low setting on travel appliances rated 50 W or less and use the high setting on travel appliances rated 50 W to 1875 W.
You should recognize the converter. The adapter that should work is the second one from the left - the one with the round plugs. BUT, is you want extra adapters, I'd suggest they you order them from the Ebay link below - they're much cheaper. US appliances use a current of 110 while Israel uses 220. Some things, such as my camera battery charger is good to use in 100 – 240 with an “adapter” – so I’ll not need a converter. The United States and most of the Western hemisphere use electrical systems operating at 110-120 volts. Almost every other country uses 220-240 volts as a standard. The adapter is simply a connector that changes the plug shape to match the outlet. It does not change the voltage or electrical output in any way. If your equipment requires a specific voltage, then you need a converter or a transformer. Converters use an electronic switch to approximate 110v by rapidly cutting on and off the current received from a 220v source. 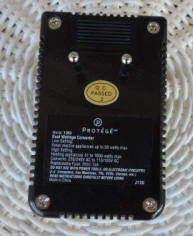 This is okay for some electrical items like hair dryers but not good for anything electronic (something with a computer chip in it). Also, converters should not be used for anything that is going to be plugged in longer than a few minutes. In other words, If you have something that only works with 110, you’ll need the more expensive converter. The plug to my camera battery charger says it’ll work for 100 – 240. I want to be able to charge several batteries while we sleep at night, so I ordered several adapters. Adapters & Converts can be really expensive – even at Wal-Mart. I just purchased a Converter & Adapter pack from Wal-Mart for $20 – but it only has 1 adapter. 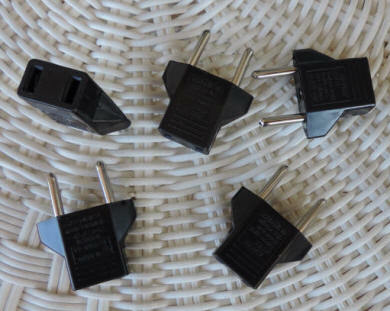 Linda found a source at E-bay where you can get adapters for $0.99. I purchased 5 and got free shipping. Most other places I found on the internet charge $5 or more per adapter. 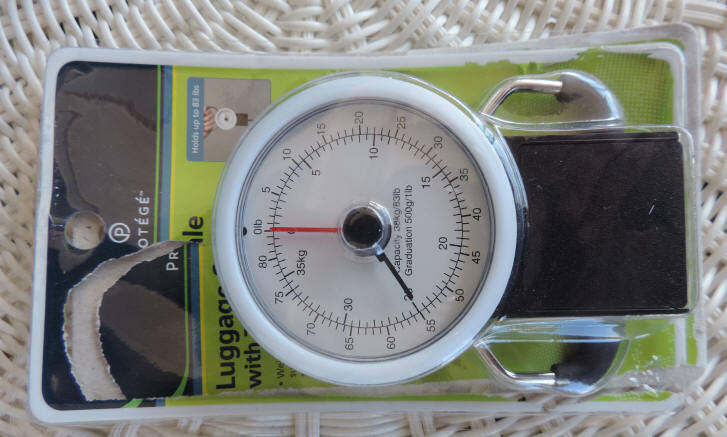 I purchased a portable luggage scale in 2011 before the trip to Israel so that I could weigh my luggage in Israel and check to be sure that each piece was not too heavy. I purchased this small portable luggage scale (with built in tape measure) from Wal-Mart. Be sure to check out all the other travel accessories in the Luggage Section of Wal-Mart. They have small travel pillows, passport covers, and lots of other stuff. There are many places in Israel where you can exchange your US currency for Israeli currency - but the exchange rate is not always the same from place to place. You should be able to exchange your currency in your hotel with ease, but there may be other places with better rates. Currently, $1US is equal to 3.8ILS (New Israeli Shekels) - in other words, 1 US dollar is about 4 shekels - meaning a shekel is valued at about 25 cents. If you buy a soda for 10ILS (Shekels), you're paying $2.50US for it - that's a little high for my taste! We carried some US cash with us, but most of our money was carried in Traveler's Checks. Shekels coins come in a variety of denominations -1/2, 1, 2, 5 and 10. Shekel Banknotes come in 20, 50, 100, 200. 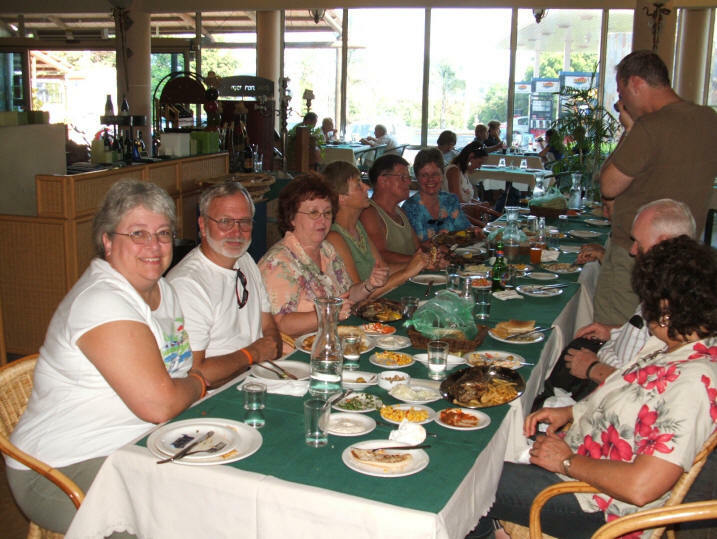 Breakfast and Dinner are usually provided with most tours. The food in Israel is absolutely fabulous. Most meals in Israel are kosher and buffet style. You'll seldom see dairy and meat at the same meal. Lunch is always eaten away from the hotel. Falafels in Israel quickly became a favorite. In the United States it is customary to tip a waiter at a restaurant between 15% and 20% on top of the meal cost - in Israel a 10% tip is what most people tip, and if you leave 15% or more, you'll be considered very generous. Breakfast and Dinner meals are included with many travel packages, but you'll have to purchase your lunch while touring - occasionally that means from a nice restaurant - and sometimes from a falafel stand. 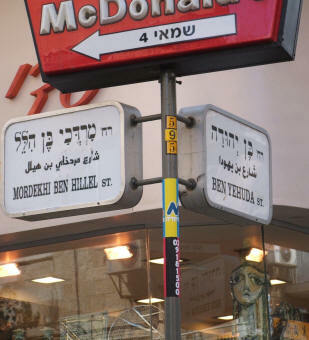 like at this McDonalds on Ben Yehuda Street. We didn't eat here. We stopped here to use the bathroom. When in Israel you need to be careful about breaking Sabbath restrictions. 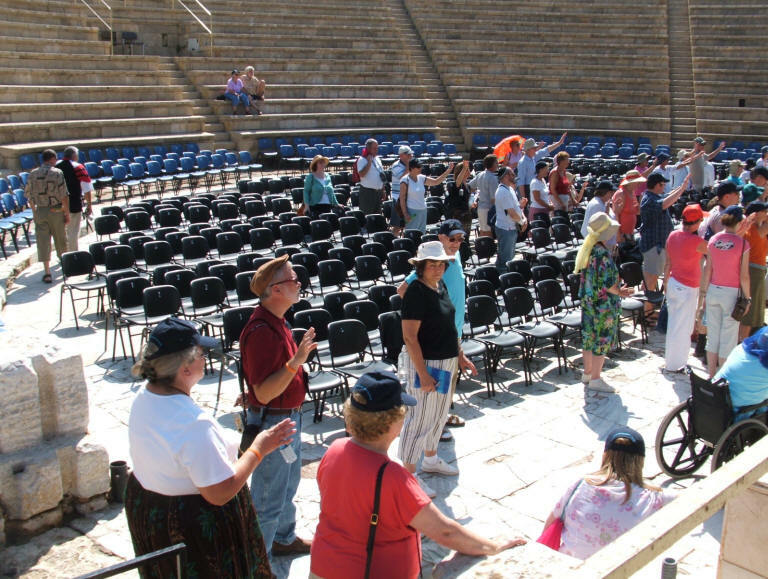 In 2005 I was not forewarned about not taking photos at the Western Wall when our tour group was there on a Shabbat afternoon. I thought I was gonna cause an international incident as the angry Jewish man approached me! Fortunately for me, our tour guide intervened for me and told him that I didn't know any better and I wouldn't do it again. The tour buses take good care of their passengers. Many locations in Israel are hilly. Tour bus drivers park at the top of the hill so that most of our walking is down hill. When we got to the bottom, the bus was there to pick us up and continue to the next location. Buses are comfortable and air conditioned. By the time we get to Jerusalem you might decide to take off on your own - just be sure you know where you're going. You don't want to end up in a Muslim neighborhood. Some folks choose to rent a car - but not me! Most cars in Israel do not have side-view mirrors. Cars in Israel don't yield to pedestrians like we do in the US. If you decide to cross the street, be sure no car is coming - he just might not stop! We did use a taxi when we were in Israel in 2005, but most are expensive and the cab drivers are usually Arab. Bus transportation is the major form of movement through the city for tourists. We used the buses there and felt perfectly safe. There again, be sure you get on the "right" bus that's going to the "right" location. One of the great joys of the trip to Israel is showing your support and solidarity with Israel and walking with the thousands of other Jews and Christians in the Jerusalem Day Parade. 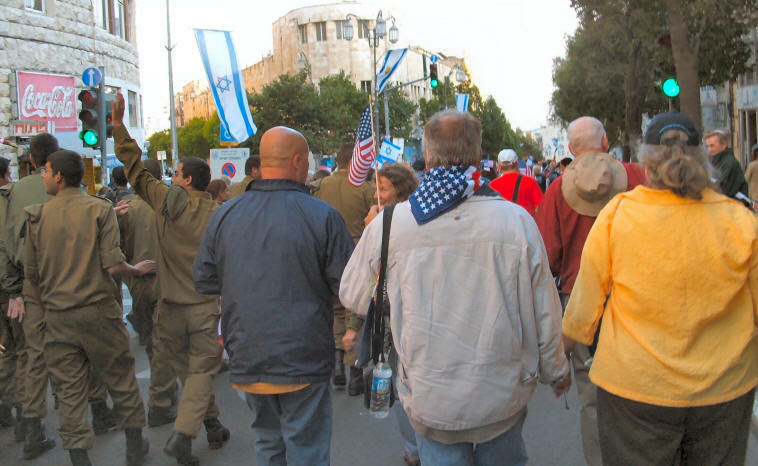 When we were in Israel in 2005, we didn't walk the entire route, but chose instead to join the US delegation when the parade passed by Ben Yehuda Street in Jerusalem. 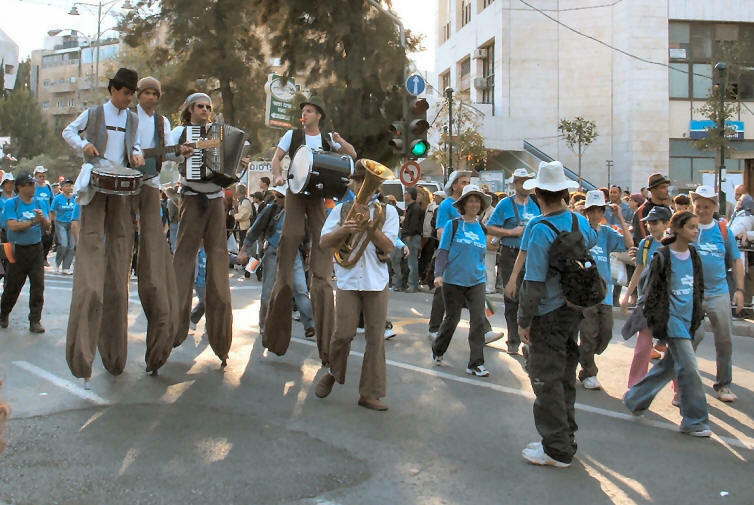 The parade goes up and down hills as it meanders through Jerusalem, so those with difficulty walking may find it a little difficult for the entire parade. Delegates from each country line up together and are frequently dressed in costumes representing their countries. Those in the parade will frequently hand out candy and small flags to the children and others Israelis who are watching the parade from the sides of the streets. Our 2011 trip with Highway to Zion should be similar. For all traveling to Israel and visiting the Kotel (or Western Wall) and even attending services in the land (or here in the US), it is important to know the culture and respect local religious laws. I researched this information and the Kotel site has specific instructions regarding conduct on Shabbat - no pictures or cell phones - and there may be restrictions for "women" wearing a "Tallit" or reading the Torah. Jewish women today wear a Tallit at reform congregations, however, Orthodox Jews and some Messianic Congregations that I visited here in the US, women are not allowed to wear the Tallit and only men are permitted to wear it. Any Day: (1) In Israel, the Jewish Orthodoxy and a ruling by the country's Supreme Court make it illegal for women to wear the tallitot at the Western Wall, Jerusalem's iconic Jewish holy site. They also can't read from the Torah or pray as a group at the Wall. Some may think that when the John the Baptist was baptizing in the Jordan River, that it was a new thing. But it wasn't. Jews had been participating in self-baptisms (called Mikvahs) for thousands of years. Most of you have seen paintings of John the Baptist pouring water over Jesus/Yeshua's head to baptize him, or maybe even a painting of John baptizing Yeshua/Jesus by pushing him into the water. 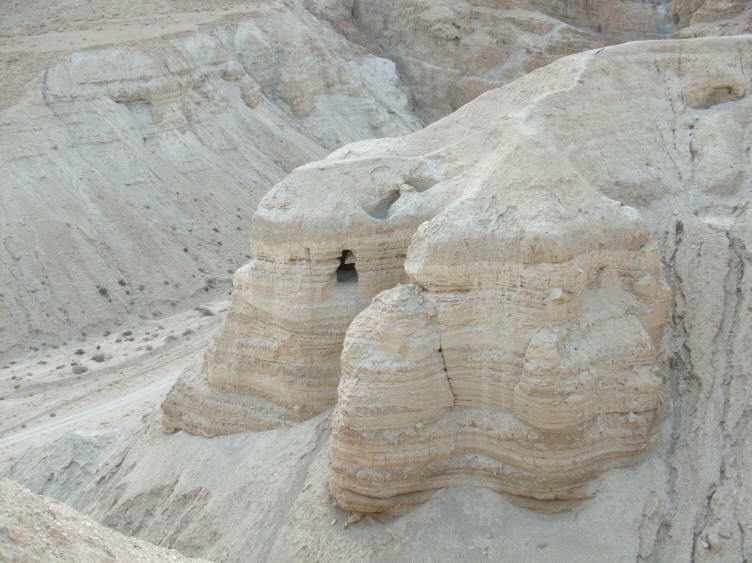 Even though John was speaking about baptism for the remission of sins, it was more than likely that Yeshua went under the water himself - in a self-baptism - called a Mikvah. Even though I was baptized "church style" after I received Yeshua/Jesus into my life and became a Believer at the age of 17, and again for my first trip to Israel in 2005, I've made the decision to participate in baptism each year that I come to Israel (if the weather permits). 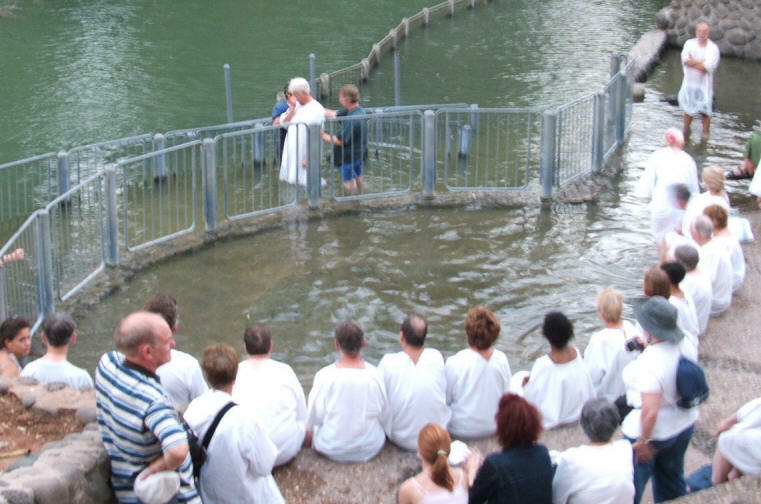 In the church, most Believers are only baptized once during their lifetime, but during Yeshua's lifetime, Jews would frequently participate in the mikvah/baptism at various times during the year. My two trips to Israel have both been in the fall, and have been planned around going up to Jerusalem for the Feast of Sukkot (Feast of Tabernacles/Booths). Participating in the mikvah/baptism is my chance to re-dedicate and teshuvah, return to the Lord, with my whole heart. If you're there, you'll want to do the same. My favorite part of the 2011 trip was visiting Masadah. 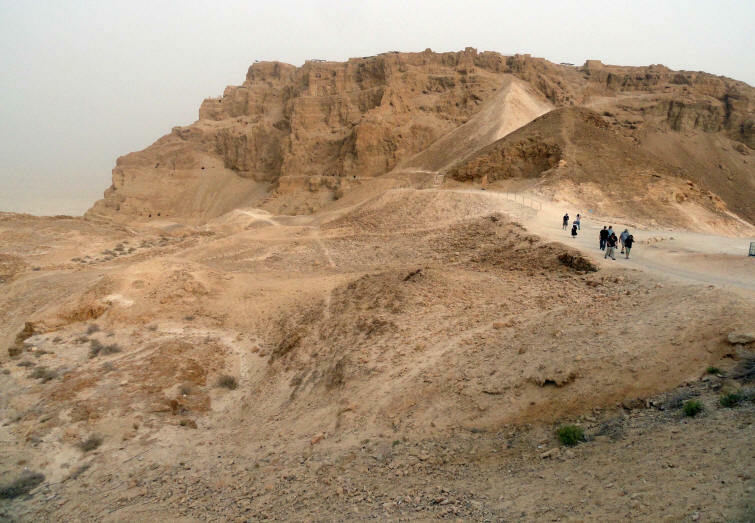 We took a cable car up to the top of Masada and afterwards we hiked down the back side. 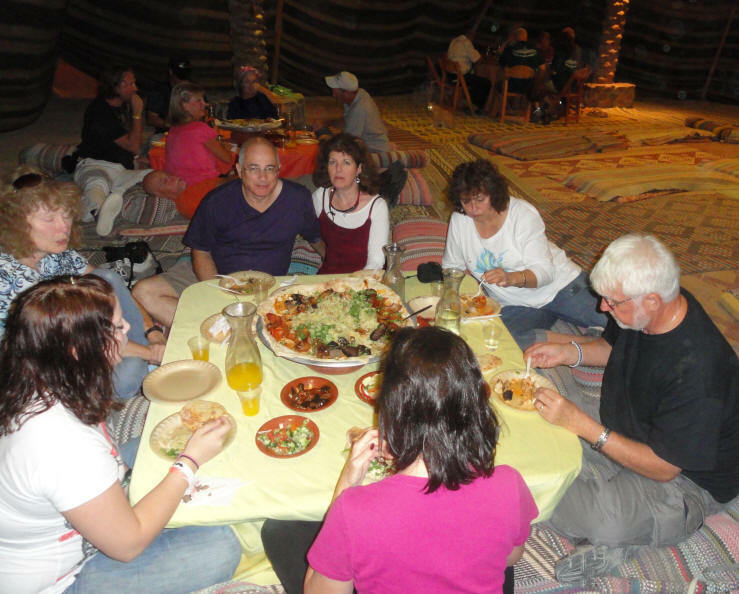 Another one of my favorite parts of the 2011 trip was the camel ride and Bedouin meal. 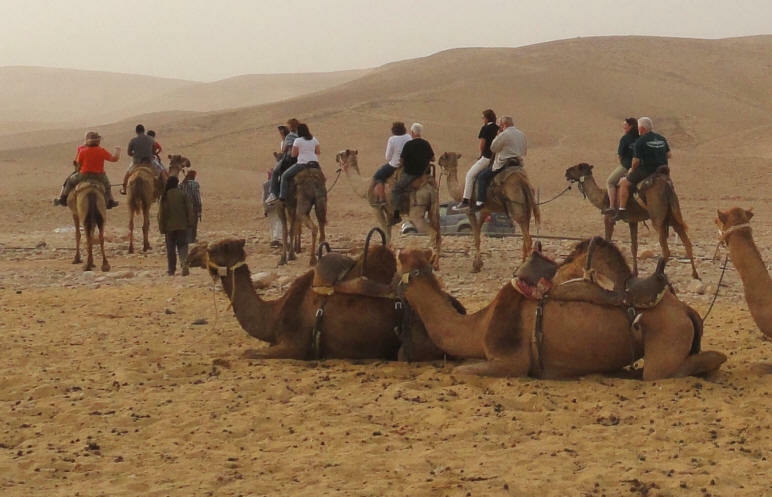 Everyone should ride the camels at least once. The Bedouin Meal was absolutely awesome - so much food! ... and so good! If you're able, sit low and enjoy the full experience!